JT: What would you say are the fundamental roots of Venezuela’s current crisis? How much blame do you think should be attributed to political decisions and other actions taken by those in power, as opposed to factors out of their control, such as economic cycles and the crash in oil price? DS: The vulnerability of monoexport economies to external prices shocks is one of the most well-understood findings in development economics. However, Hugo Chavez and then Nicolas Maduro chose to ignore these understandings and the country is now paying the price. Over the course of ten years Chavez spent all the money coming in, setting little aside, and worse yet, allowed the currency to become seriously overvalued for years. Over time this made imports cheap and domestic production uncompetitive, undermining local productive capacity and making Venezuela ever-more reliant on imports. As a result, Venezuela’s economy became exceptionally vulnerable to a commodities price crash, and that is exactly what happened. Venezuela has suffered more than any other oil exporting countries. With oil at less than $50 a barrel, they do not have enough money to both make their debt payments and import basic goods. So they have decided to make their payments and reduce the dollars available for imports. Imports have declined 40% with respect to 2015 and by more than 60% since 2012, when Chavez was reelected. This is the cause of the terrible shortages of food and medicine that average Venezuelans are suffering. It is not the result of an economic war or hoarding. It is the predictable result of failed economic policies. You can now get a hundred times more Bolivares (the local currency) on the black market (1000 per $) than at the official rate (approximately 10 per $). This not only creates the distortions mentioned above. It creates irresistible incentives for corruption among those who have some access to official-rate dollars. Many of the dollars the government does have do not go to paying the debt or importing goods, but to capital flight or “arbitrage,” i.e. they get funneled to the black market. And any time you get these kinds of lucrative distortions, you get stakeholders that benefit from them and prevent change. This is why the fairly obvious macro-economic changes that need to take place simply do not happen. Anyone who pushes in that direction—Jorge Giordani, Rafael Ramirez, Nelson Merentes and most recently Miguel Pérez Abad—eventually gets pushed out. You can add to this that since 2007 the government has adopted a leninist governing discourse that devalues, in fact has considerable disdain for: transparency, accountability and internal debate and criticism. As a result Chavismo has not shown a capacity to rectify and take even modest and obvious steps to reorient its policies. While there is a dissident Chavista movement has developed in and around the Aporrea.net blog, they are marginalized from power. Chavismo in power has little serious internal debate and that has facilitated its moving headlong down an obviously unsustainable path. In sum, Chavismo has an unsustainable economic model that leaves it vulnerable to external shocks and corruption, and model of governance that prevents the internal feedback that could right the ship. JT: Who is really in charge of the country, right now? DS: It is not entirely clear. Maduro is not a strong leader which always leads to the suspicion that someone else is calling the shots behind the scenes. But it should be remembered that Hugo Chávez spent fourteen years concentrating power in the position of the presidency. As holder of this position, Maduro wields considerable power. It is clear that from his first months in office he has coddled the military and cultivated their loyalty. He has given them a bank, a television station, control over the citizen security apparatus from top to bottom, and control over food importation and distribution. All of these activities have lucrative opportunities for kick-backs. At this point it is not entirely clear who is in charge, Maduro or the military. I tend to think Maduro is more in control than many think. JT: How likely is political change? What are the vested interests in the status quo that make that challenging? DS: It is looking increasingly unlikely that we will have a recall referendum this year, which the government would definitely lose. If it gets pushed to next year it is not clear that it will actually happen or that the opposition will win it since it would simply mean that the VP takes over. If people see that the only result of participating in a referendum is that Cilia Flores or Diosdado Cabello become president, a significant portion could abstain. But it seems unlikely that Chavismo can stay in power beyond the 2018 presidential elections unless it becomes an outright dictatorship. The government is extremely unpopular and seems incapable of changing course. There are many Chavistas who would like to see Maduro pushed out. However, they don´t necessarily want the opposition in power as that could expose them to retribution, judicial processes or even extradition. Thus they are doing everything possible to push the referendum until after January 10. DS: The opposition has long suffered from: internal divisions, a lack of connection to average Venezuelans, and an inconsistent commitment to electoral democracy. And these opposition weaknesses have been key to Chavismo’s success. However, in the last year they have put together a minimal agreement that has allowed them to work together, and they have benefitted from Chavismo’s declining popularity. They still do not have much of a message. But the extent of the crisis people are experiencing is a message in itself and works to aggregate interests. This allowed the opposition to sweep to a clear majority in the December 2015 legislative elections which gave them a two thirds majority in the National Assembly. Since then they have passed a number of popular legislative projects–such as the provision of property titles to the beneficiaries of the government housing program Mision Vivienda, which had over 70% support even among Chavistas. However the Maduro govenment has used the Supreme Court to block virtually all of their legislative projects. Thus while for many years it was the opposition that seemed incapable of listening to the voice of the people as expressed in the elections—remember that the #LaSalida movement of 2014 pushed for Maduro’s resignation only two months after Chavismo had received strong support in the nationwide municipal elections of December 2013—now it is Chavismo that cannot bring itself to soberly recognize the message the people sent at the polls last December. The September 1 mobilization that brought hundreds of thousands to the streets of Caracas marked an important milestone for the opposition. In the past two years their mobilizations have suffered from poor turnout both because of the lack of message and fear of repression. But this one brought masses of people into the streets. The fact that it was successful and was not repressed in any significant way will likely produce more mobilization. Indeed a day later we saw Maduro suffer a cacerolazo—a pot banging protest—in a visit to a traditional Chavista stronghold on the island of Margarita. We could see more acts of defiance in the near future. The CNE’s suggestion, in August, that the referendum would not be until February or March also marked a turning point for the people. When an electoral event looks like it could bring about change, it serves as an outlet for people’s anger and frustration. When that possibility is withdrawn from the political process, people start pushing in other ways, such as street mobilization. That is what happened in 2014 and that is what could happen this year if the CNE continues to impede the referendum. At this point it makes sense for the opposition to avoid developing a platform, plan and message for what it is proposing for Venezuela. Doing so would highlight internal divisions at a time when they need unity. But it does leave them vulnerable as it does not allow them to anchor people’s political preferences. If oil were to suddenly surge, or if they were to suddenly find themselves at the helm of a government that needs to carryout unpopular reforms, popular support could swing back to Chavismo quickly. Thus at some point in the medium term they need to actually put forward a plan, or at least a vision of what they would do if they were to control the presidency. JT: What about international engagement? Why has there apparently been so little? Could it help? DS: I think international engagement is the only way a suboptimal outcome can be avoided in Venezuela. And “engagement” is just the right word. The preferred hydraulic metaphor of “pressure” is often counter-productive in international relations, especially in a country with a strong anti-imperialist ideology. International “pressure” gets used by the government to deflect attention from its own shortcomings by suggesting it is the object of an international conspiracy. The US government’s strategy of placing targeted sanctions on Venezuelan officials and pursuing them judicially ends up providing Nicolas Maduro with a committed and loyal core that will fight to the death to keep Chavismo in power. There needs to be dialogue facilitated by international actors that can provide a plausible democratic mechanism for a transition, and a plausible exit strategy for Chavismo as well as democratic guarantees and alternatives for the many Venezuelans who do not feel represented by the opposition. Over the past fifteen years Latin America has gone through a process of regional integration and hardening of the sovereignty of states that has meant that Venezuela is more resistant to the influence of the US and the OAS. And the new multi-lateral institutions such as the Union of Southern Nations (UNASUR) and the Council of Heads of State of Latin American and Caribbean Countries (CELAC) still do not have articulated understandings and practices for dealing with this kind of situation. The OAS does and Luis Almagro’s invocation of the Democratic Charter in June, and the three discussions of Venezuela it led to, were very positive. The impact the OAS still has on Venezuela is evident by how much attention and energy they put into countering Almagro’s initiative. They could have ignored it. Instead the responded with a full diplomatic effort. I think we have not seen the end of Almagro and the OAS’s initiative on Venezuela and the Maduro government knows it is being watched closely. JT: Why has it been such a challenge for international aid to enter the country and reach those in need? DS: The idea that there is a humanitarian crisis in Venezuela is itself controversial and politicized. On the one hand, for years the opposition has tried to suggest that there is such a crisis in Venezuela to try to generate some sort of international intervention. This was and is the idea behind slogans like #SOSVenezuela. 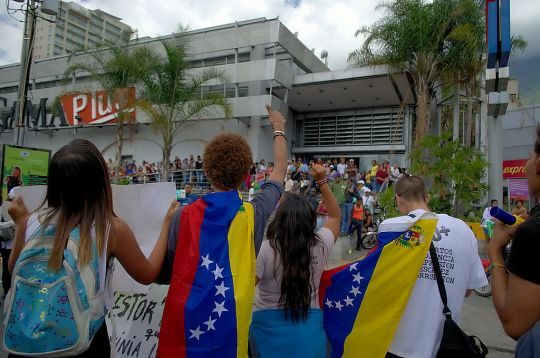 It provides a depoliticized image of an undifferentiated “Venezuela” suffering from the tyranny of an illegitimate government, and which therefore needs foreign intervention. The idea of a “humanitarian crisis” fits directly into the existing terms of opposition´s political project. On the other hand, one of Chavismo’s central elements is the idea of hardening Venezuela’s sovereignty. So allowing international aid would not only be an implicit recognition of the degree of the crisis, it would undermine one of the central tenets of their political ideology. But of course, the reality is that Venezuela does need aid because people are in fact suffering and going without vital basic food items and medicines. As long as this is the case and the government does not accept aid because of political calculations, it deserves vigorous criticism. JT: How can Venezuela extricate itself/be hauled from this crisis? DS: There needs to be some sort of negotiation that will allow for a democratic transition either to an opposition government or a reformulated Chavismo. Venezuela has the largest proven reserves of oil in the world, a modern and educated population, and reasonably developed infrastructure. Investment advisors tell me that with a good set of policies there is no reason Venezuela could not turn around within a couple of years and regain its prosperity in five or ten. It needs to move away from being a rentier state, exploit its oil in a rational and sustainable way, and seek to diversify its economy. Whoever ends up in charge will need to examine what has been learned from seventeen years of Chavismo and soberly reflect on how to aggregate and represent the demands of a population that is not willing to tolerate high levels of poverty and inequality and wants to have active participation in its government. Simply trying to turn back the clock to the neoliberal 1990s is not going to work with a population that has tasted what it means to be included.